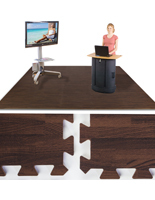 Tiles interlock like jigsaw puzzle for fast and easy set up. 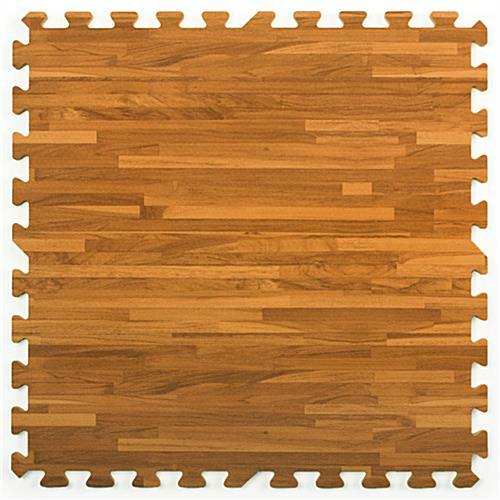 Complete wood grain design floor tile kit covers a 10' x 10' area. Include two sides border pieces for creating different size floor mats. 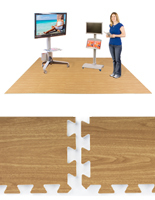 Features a comfortable and anti-fatigue surface for staff members and attendees to stand on. Not designed for outdoor use. These portable flooring, interlocking floor mats are engineered for long lasting durability in high traffic application. The close cell EVA (Ethylene Vinyl Acetate) foam mat construction is light, portable and water resistant, great for use in any special events. Along with the classic and traditional wood grain design, these interlocking floor mats makes your booth areas look more professional and eye-catching. 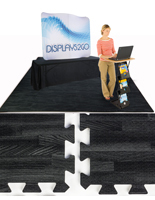 These interlocking floor mats are a wonderful way to create a restful, defined space at a busy convention hall. Give a little extra comfort to your trade show customers by placing these interlocking floor mats. These interlocking floor mats, such as portable flooring are resilient, enabling you to place display tables and chairs on top of the mats. 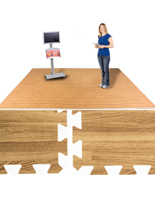 The 2 feet by 2 feet interlocking mat corner piece interlocks on two sides with other border pieces. These interlocking mats also allow you to create your own floor mat size. 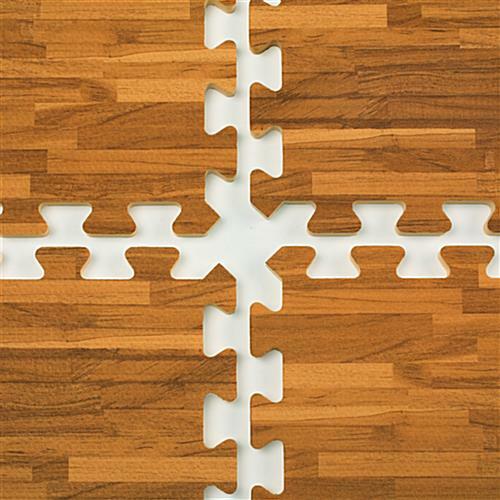 These interlocking mats tile interlock like puzzle pieces for fast and easy installation. 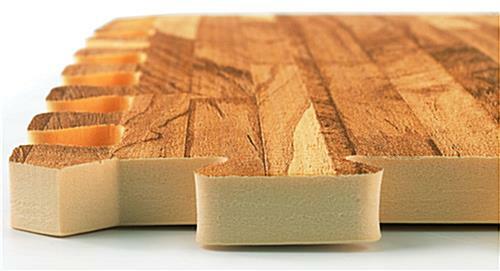 The interlocking mats can be place directly on concrete or tile with no adhesive needed for a snug or tight fit. 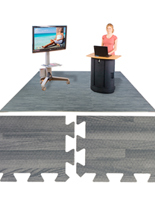 Create a comfortable atmosphere for staff members and attendees to stand on with the interlocking floor mats. Please Note: This unit is water resistant but is not designed for outdoor use. 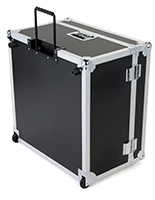 Do not place heavy display fixtures or equipment with small feet on the mat. Some high heel shoes may leave a permanent imprint as well. Each section is a soft tile with a foam interior that can be damaged by heavy objects. 120.0" x 0.5" x 120.0"
I have used these same printed foam floors for years - but was paying much more from another vendor. Although high heels will poke holes, and normal scuffing will eventually occur, they are still perfect for my art show needs. I know the disclaimer says they are for indoor use only, I have used mine outdoors on all kinds of surfaces without any problems. The closed cell foam does not absorb water like a carpet. Displays2go has super-fast shipping and you just can't beat the price! Eric, thank you very much for taking the time to write this excellent review! We're so happy that you found us, and we're glad that our interlocking floor mats are perfect for your art shows — even when displayed outdoors. 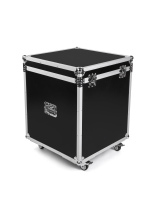 We're proud of our ability to ship many of our products same-day, and at an affordable price. We hope you'll continue to turn to us for your art show needs. Thanks again! We bought these foam mats to use at trade shows. It is much cheaper than having to rent carpets. It made our booth look very professional and they are nice to walk on. I highly recommend them. We can't get ogre how awesome your booth looks, Holly! The knee lamp is a really nice touch, and the floors look amazing! Thanks you so much for taking the time to share your photo and to recommend our floor mats. We value your business with us very much, and we hope you'll continue to turn to Displays2go for Ogre Sheild's trade show needs. These floor mats were a worthwhile investment for us. Rather than carrying around a 10x20' rollout rug, these squares are much easier to transport and set up. 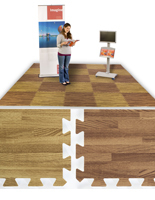 We purchase this flooring for our trade show booth instead of purchasing carpeting. This flooring looks 10X better than the carpeting expo halls provide and is 10X cheaper! My only con is that this flooring can get scuffed up over time. We re-purchase this flooring every year, and we're never disappointed! Thank you so much for the excellent review, Cameron! We're glad that you found these floor mats to be a much better alternative to expo carpeting, and we appreciate your feedback regarding the durability. 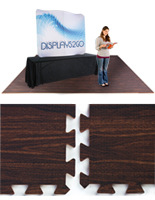 If you're still designing your booth, we would highly recommend that you check out our large selection of high-quality and affordable trade show fixtures and displays. We look forward to doing business with you again soon! Looks great, works well, 1/3 the price of just ONE show carpet rental. That's awesome! Thanks so much for letting us know what you thought!